Friday August 10th 1883 I went to town this morning and came right back again. Mother went to the valley and took May with her. they did not get home till night. I was busy about the work a good part of the day I played on the piano some and worked some pillow cases. 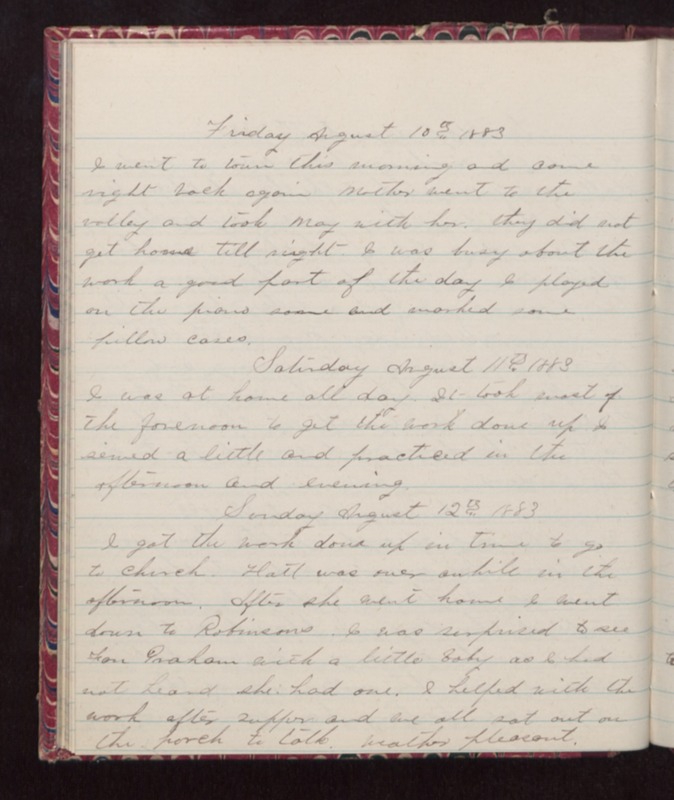 Saturday August 11th 1883 I was at home all day. It took most of the forenoon to get the work done up I sewed a little and practiced in the afternoon and evening. Sunday August 12th 1883 I got the work done up in time to go to church. Hatt was over awhile in the afternoon. After she went home I went down to Robinsons. I was surprised to see Fan Graham with a little baby as I had not heard she had one. I helped with the work after supper and we all sat out on the porch to talk. Weather pleasant.